Between my baby birds and visiting family, I am at my wits end. Last night I actually slept 4 hours straight. With family now gone I can relax a little and enjoy the 4 hour breaks in feedings during the night. As for purple martins, my gourds are now clean and bagged up. The house is scrubbed and plugged. Only a few minor details left in the long overdue fall clean up. I was talking to someone the other day and I was telling them why I write a blog. I guess it is important to first define a blog. According to www.blogger.com, A blog is a personal diary. A daily pulpit. A collaborative space. … Your blog is whatever you want it to be. So my thanks to you for reading my humble opinions, observations and thoughts. Isn’t the internet great? There is no way to deny that Autumn is upon us. Some stores even are putting up Christmas decorations. 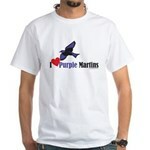 Though we are in the midst of our yearly purple martin drought, I will artificially slake my thirst for purple martins. “How”, you may ask? The only way I know how…paint. I have been hard at work painting some new pieces. I hope you enjoy the first. Please pardon some of the color rendering, the scan does not do justice to the blue sky of the original..it ends up looking white. Many watercolors can not be accurately captured and duplicated on the internet. 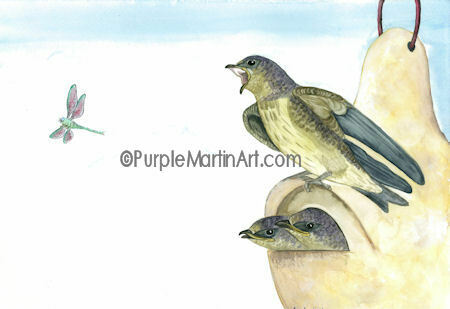 I have been looking around the internet and found a great little nature blog called “Journals of an Amateur Naturalist” with plenty about the authors well managed purple martin colony. Check it out if you get a chance.